Squash House Quilts: Jack & the Brussels Sprout! Jack & the Brussels Sprout! Most of us are familiar with the old Fairy Tale, Jack and the Beanstalk. It was always one of my favorites. That, and the tale of Johnny Appleseed. This weekend I decided it was time to pick our broccoli before the slugs made them a fall feast! When I took a look at what was there after the leaves were cut away, Jack and the Beanstalk immediately came to mind! I was absolutely amazed! From one tiny seed came these enormous stalks just waiting for some of my favorite recipes! On the left is one plant after the leaves were cut away, and on the right is how they look after I removed the crowns and before I cut away the leaves! Here is a closer view of those luscious sprouts! Before I met Mr. Squash I didn't like them at all! The only way I'd ever had them is when my mother boiled and buttered them. But Mr. Squash loved them so I wanted to find a way that I would as well. Thanks to some great recipes from Martha Stewart and others, I've come to know and love these little gems! By the way, that is celery above the sprouts - I had completely harvested them earlier this summer, but they came back again! How I love the soil in this neck of the woods! 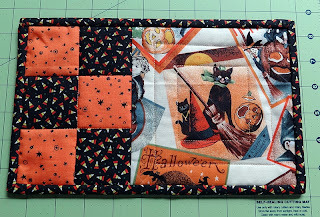 I'm a little slow this year in getting my Halloween decorations up and about, but I did get this little mug rug made for a friend. I thought it turned out pretty cute - and it was all from stash! Tomorrow we're heading to Leavenworth, Washington for a couple of days. We might even fish the Icicle river one day if the weather is good. We'll also visit a couple of farm stores along the way and see some fall colors in the mountains. I'll be sure and take some great photos for you upon our return! Brussel Sprouts are an interesting plant but I'll just let others enjoy them as I do not like them, Sam I Am. Very cute mug mat. Have a great trip. Fishing in Icicle River sounds freezy. I've never seen brussel sprouts growing before. What an interesting plant it is! Cute mug mat, too. 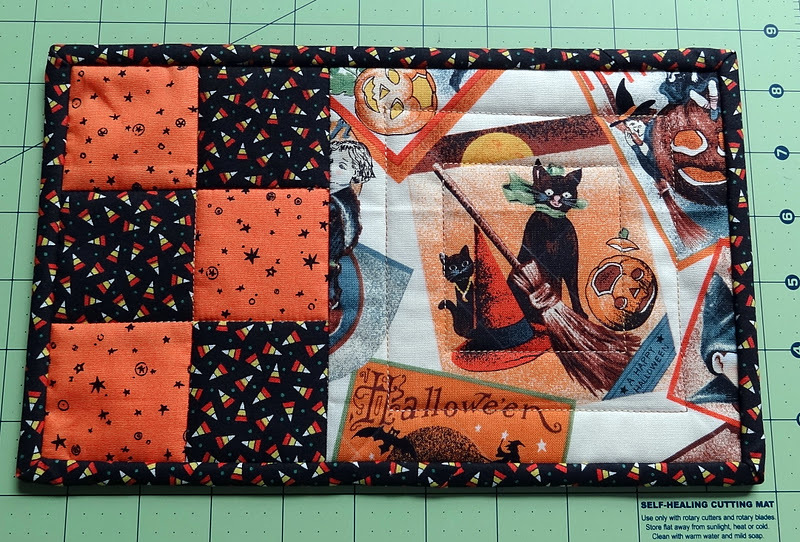 I like the way there is a great Halloween print with the piecing. 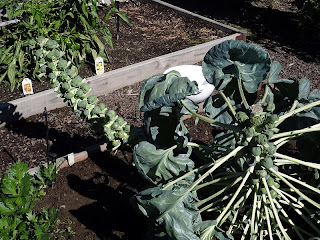 I had no idea what brussel spouts looked like while they were growing. I didn't expect them to look like that. Enjoy your trip! I hope you're able to get in some good fishing time while you're gone. 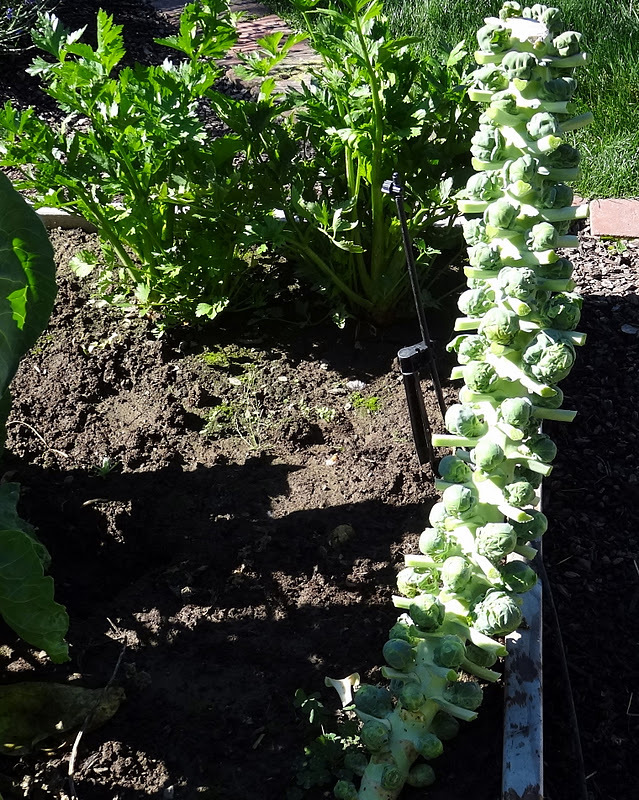 Look at those beautiful brussels sprouts! One of my favorites - enjoy! Your Brussel sprouts are glorious! I love eating them. How nice that you found some delicious recipes to make with them :) Your Halloween mug rug is adorable! Love the mug mat - wonder who that went to?!!! I was going to post about it (and the other fun stuff!) this morning but my editing program gave me fits and I finally just gave up. Hope you have a great trip! Have a great, safe trip! 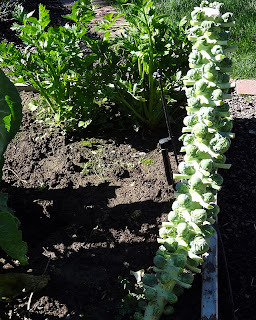 I love Brussel sprouts and will be trying to grow them too in our new garden plot. so cool about the celery. I will be trying that too. Boy I bet that river must be cold if it is called Icicle. Spooky Supreme Peek and Hexagon Madness! Quilted and Bound Labor of Love!